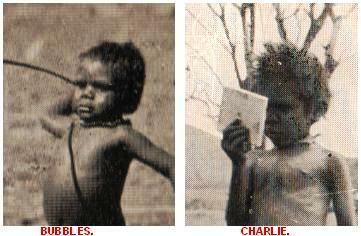 "We called the big one Charlie The little boy cut his name short to Publs". .and a tin of lollies. The men decided the younger boy was the son of the leader of the small band and about four years old, his hearty chuckle of laughter prompted either Taylor or Sutherland to name him Bubbles. The older boy at about nine years of age was solemn, very intelligent and with a film star smile and was named Charlie. Both boys were soon mingling with the men of the expedition and became fine ambassadors. Sutherland and Bubbles were especially good mates despite Sutherlands mischief with a mirror, and it was Charlie who found the common word that broke the language barrier and opened useful communications between the two groups. Fred Blakeley's erratic recollection is acknowledged, but on the matter of meeting Bubbles and Charlie and their Elders he is at least consistent and goes to some trouble to separate Rip Van and his family group from the band of five Sandhill Men and two boys. And in fact makes a point of noting that Rip Van had disappeared whenever the sandhill men were in camp. Coote makes passing reference to Bubbles and his appetite, his success with matches and the numerous burns on his stomach, it is Idriess of course who credits Bubbles with an enormous capacity for drink and food, not unusual for children, but it did not include oranges from the 1930 G.A.G.E. expedition to Illbilla, the fools didn't carry any, those oranges that Bubbles enjoyed daily came from the McKay expedition that had used Illbilla as a base some months earlier. Blakeley Fred. Dream Millions 110-112. Coote E. H. Hell's Airport 160. Idriess Ion L. Lasseter's Last Ride 47. Marshall-Stoneking Lasseter, The Making of a Legend 57.